Our room set-ups can be custom designed to accommodate your group’s needs. Choose from the Stone House Hall (seated max capacity – 70), the Maples (seated max – 275), the Southlawn Tent™ (seated max – 160). Our outdoor areas can accommodate groups as large as 5000. Our largest f acility boasts vaulted ceilings, wide naturally lit foyer, additional smaller “breakout rooms”, two large covered patios, collapsible partition wall to divide the space into two separate areas, and fantastic views of the grounds & gardens. 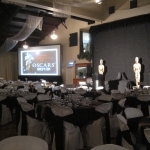 This large open concept space, offers all of the amenities of a traditional banquet hall with the outdoorsy feel of a marquee tent. Its cedar beam construction, tin roof, finished cement floor, freshly renovated washrooms, DJ Booth, and panoramic views of the farm make for a memorable backdrop for any special occasion. Our coziest facility offers you quaint comfort nestled between our turn of the century fieldstone farmhouse & waterfall garden. It features a limestone fireplace, a large covered front porch for dancing under the stars, and floor to ceiling windows that offer breathtaking views of the surrounding grounds.